Since the modern Olympic Games kicked off in 1896, a few weird and wonderful sports have come and gone, from live bird shooting to solo synchronized swimming. When Paris hosted the 1900 Olympic Games, live pigeon shooting was a key event. The object of this event was to shoot and kill as many birds as possible. This was the first and only time in Olympics history when animals were killed on purpose. The birds were released in front of the participants and the winner was the one who shot down the most birds from the sky. The participant was eliminated once they missed two birds. Nearly 300 birds were killed. The event turned out to be quiet messy in the end with dead or injured birds on the ground and blood and feathers all over the place. An award of 20,000 Francs was the prize for the winner, with Belgium’s Leon de Lunden earning gold with 21 hits. Well, good news is the sport is banned in Olympics. This event, like some of the others on this list, was a demonstration sport. The concept of these demonstration sports was to showcase potential new events at the Games, and depending on how they were received, decide if they would be given full accreditation. 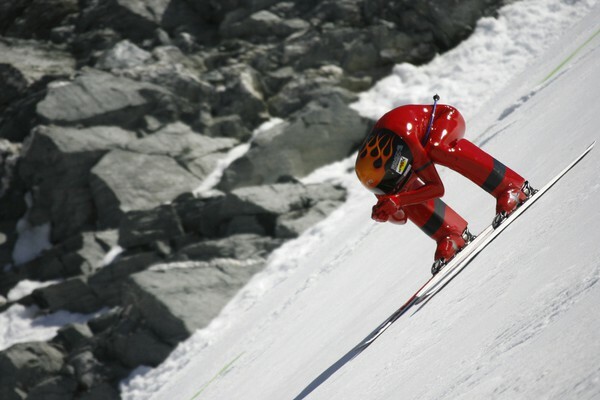 Demonstration events were scrapped by the International Olympic Committee after 1992, which was a shame - as events such as Speed Skiing had some potential. The idea of this one was to see who could go fastest down the mountain without crashing. As competitors risked their lives trying to clock the quickest speed they reached well over 200kmh. Despite seeming like an activity you did in your backyard when you were 10, trampoline debuted as an Olympic sport in 2000. Gymnasts take to the trampoline, somersaulting and flipping as stern-faced judges keep score. "Precise technique and perfect body control are vital for success, with judges delivering marks for difficulty, execution and time of flight, minus penalties," Olympic officials say. Think: Ice hockey minus the ice. (Alternatively: Think Wayne's World, plus roller skates.) The sport enjoyed both its debut and its swan song at the 1992 Barcelona Games, but enthusiasts still compete at the world level. Here, Switzerland and Portugal face off at the 38th Roller Hockey World Championship in 2007. This feat of strength worked like the classic playground game: two teams pulled a rope in opposite directions until the midpoint of the rope passed into the winning team’s territory. This may seem as the basic gym class sport more than an Olympic event, but Tug of War was actually the first sport played at the Olympic Games. Originally the competition was entered by clubs, which meant that one country would win several medals. In 1904, United States won all the three medals and in 1908, Sweden was among the top countries with two medals, one as the member of the mixed team. In 1912, the Tug of War contest consisted of a single match, as only two teams entered the competition. Sweden was represented by Stockholm Police, while Great Britain’s team was represented by the City of London Police. During its time as the Olympic sport, it was considered to be part of the Olympic athletics programme, although the sport Tug of War is now considered extinct in Olympics. Current Olympic events include the long jump, the high jump and the triple jump - which suggests we're fans of events of the jumping variety. And between 1900 and 1912 we had the standing high jump - which was exactly what the name suggests. Pictured is Ray Ewry, who won gold at the 1908 London Olympics. Unsurprisingly, this seemingly contradictory sport earned little respect when it made its initial splash at the 1984 Los Angeles Games. Despite the absurdity of staying in sync with oneself – though the event’s supporters claim that the synchronization is with the music — the event reappeared at the Seoul Games four years later and again at Barcelona in 1992. From there on out, the solo synchronized swim competition was folded into a team event and the sport has since risen in prominence, though men haven’t been allowed to compete in either Olympic discipline. Perhaps with the CrossFit fury, good old-fashioned rope climbing may once again appear at a future Olympics. Prior to being discontinued, the rope climb marked the final event of the gymnastics competition. While typically being judged on time to reach the top, in 1896, athletes were also judged on style. Yes, there's plenty of fan interest for sprinters, distance runners and hurdlers. But what about their slower counterparts? If you can believe it, those middle aged ladies you see speed-walking around the park before bathing suit season are actually doing something athletes spend years of their lives training to do properly. Of course, Olympic race walking competitions are 20 and 50 kilometers in length (12 and 31 miles, respectively) which means they require a heck of a lot more endurance than your average walk around the park. The hardest part? Making sure you're moving as fast as you possibly can without breaking contact with the ground and therefore "running." Talk about concentration! As a method for resolving offenses of honor, dueling dates back to medieval times. The history of dueling as a sporting pursuit is more difficult to trace. Certainly, pistol sports have been around for some time, dating at least to the 1896 Olympic Games, which included several rapid-fire pistol shooting events. The dueling pistols competition, begun in 1906, took pistol sports to a new level. No competitors were harmed since the target was not another dueler but a stuffed dummy. This faux adversary, by some accounts decked out in a frocked coat, was fired upon from distances of 20 and 30 meters. The dueling pistols event was discontinued after the 1912 Stockholm Olympics but continues to hold the public’s fascination: A poll conducted before the 2000 Sydney Olympics showed that 32 percent of respondents would like to see dueling pistols reinstated as a sport.